In this course we’ll explore complex analysis, complex dynamics, and some applications of these topics. 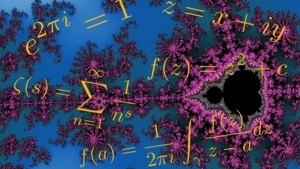 This course provides an introduction to complex analysis, that is the theory of complex functions of a complex variable. We'll start by introducing the complex plane along with the algebra and geometry of complex numbers and make our way via differentiation, integration, complex dynamics and power series representation into territories at the edge of what's known today. CosmoLearning is promoting these materials solely for nonprofit educational purposes, and to recognize contributions made by Wesleyan University (Wesleyan) to online education. We do not host or upload any copyrighted materials, including videos hosted on video websites like YouTube*, unless with explicit permission from the author(s). All intellectual property rights are reserved to Wesleyan and involved parties. CosmoLearning is not endorsed by Wesleyan, and we are not affiliated with them, unless otherwise specified. Any questions, claims or concerns regarding this content should be directed to their creator(s).